Deer Control Fencing that Works! Recently, deer have become the foremost nuisance to home gardens, landscaped foundations, and agriculture. The damage that deer cause to horticulture has become a major plight to both homeowners and agronomists. Our talented staff at Benner's Gardens has developed deer control fencing to reduce and ultimately eliminate damage caused by deer. 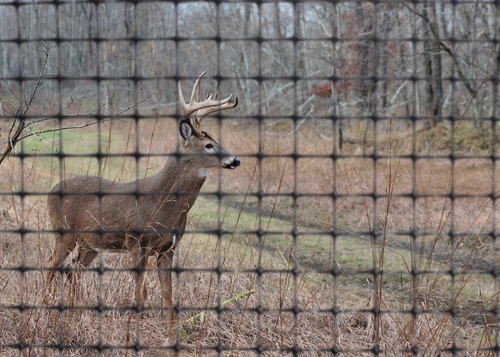 Our innovative deer control fencing system uses mesh netting that will safely prevent deer from entering your property. Unlike harsh repellents, our deer control fence is both animal and environmentally friendly. We at Benner's Gardens understand the importance of maintaining the beauty of your landscaped grounds. As a result, our deer control fencing is made out of practically invisible, lightweight mesh material to ensure that the eye is drawn to your garden, not our fence! Competitively priced, our deer control fencing is an affordable solution for any location. With the ever-growing deer population, it is imperative that you find solution that is cost-efficient, durable, and reliable. Deer can be persistent pests and often attempt to go under or directly through other fences. Taking this into consideration, our deer fence is literally built from the ground up! All of our deer control fencing kits come with ground stakes, making it impossible for the relentless deer to penetrate. Ensuring that all entrances are blocked, our deer control fences begin at a minimum height of seven feet. This will prevent deer from jumping over the fencing system. Our original design has also been proven effective at deterring rodents and other pesky animals from penetrating your property. Offered in a variety of sizes, you can be sure to find the perfect solution to meet your individual property needs. Here at Benner's Gardens, we understand the importance of simplicity. Our deer control fencing kits come with everything you need for a quick and easy installation. Keep both your property and the deer safe with our deer control fencing! Our deer control fencing kits include everything that you need so that you can easily install the fence and keep your property safe from deer and other animals. Remember that the fencing material is nearly invisible so it will not take away from the beauty of your property. Once you learn exactly how much fencing your will need for your property then you can decide which deer control fencing kit is right for you. If you have any questions about our deer fencing products please make sure to contact us directly.